I best stay here in bed with back-to-back episodes of Gilmore Girls because it’s really too late to read that book that I know I should read because well, it’s late and I won’t actually retain any of it anyway so I will save it for tomorrow when I’m fresh and then I’ll probably actually sit down and read the entire thing! And tomorrow I’ll even file those bank statements – I couldn’t today because I needed to do the mountain of laundry, and while the washing machine was doing its thing I needed to scroll through Pinterest and pin all the things because I’m planning on meal planning and I just needed fresh inspiration. I am also going to home-bake every single lunchbox snack for my kids – no longer will they have anything out of a package. Tomorrow can be a baking day! While I was on Pinterest I pinned that beanie I’m going to crochet. I can’t do it now while I’m watching Gilmore Girls because I don’t have the exact sized crochet hook that I need, and I think I need a different shade of grey yarn than the one I already have. I also need to register the dog, but that means printing off a form from the council website and my printer has run out of ink. Tomorrow I’ll work on my tax as well. I can’t do it because, you know, I haven’t had time (Pinterest) and the bank statements aren’t filed yet and the ink, we need ink. I’ll get some tomorrow after my run. I couldn’t run today because my favourite leggings were in the wash – it was way too cold to wear 3/4 leggings, I needed my full-length ones. It was too cold to hang the washing too. I’ll do that tomorrow. It will need another re-wash, it’s been in the machine for a while now because it’s raining and it means I have to get the clothes horse unfolded, which is hard. And the clothes horse is in the same place as the ironing board and I need an excuse not to have to get that out, because even if I do happen to get it out and I do happen to iron something, the ironing board won’t put itself away and when I walk past it multiple times throughout the week it will just annoy me that it’s still sitting there and it’s not put away yet. Just like that oven dish that is still sitting on the oven because I can’t stuff it into the cupboard because the contents of said cupboard are in complete shambles and if I even open it, at least five things will fall out of it. So I’ll tidy that cupboard tomorrow so I can put that dish away. I’m sure you live a much more productive life than this. But so often lame excuses are in the way of me actually making progress. And instead of being overwhelmed at having to adult my way through the day and burying my head in the sand Netflix, there are some things I have been doing and principles I’m applying to just get the stuff done! 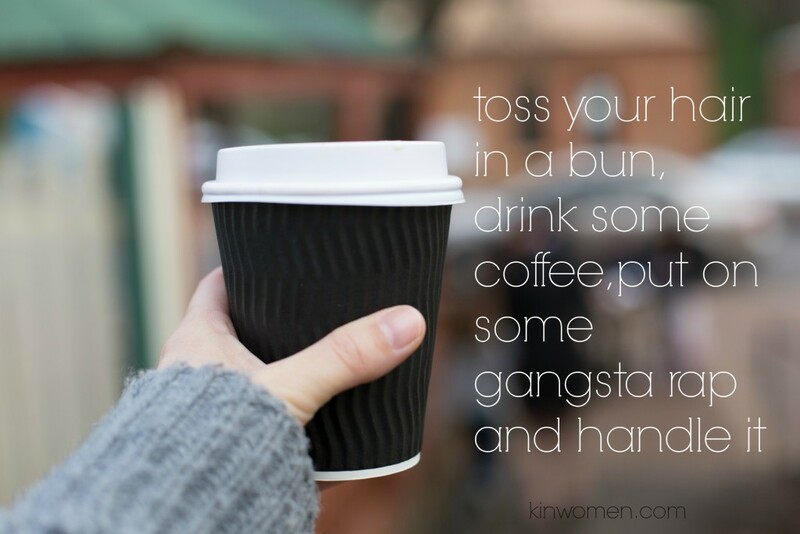 • Toss your hair in a bun, drink some coffee, put on some gangsta rap and handle it!